Most people know little or nothing about diamonds. That's why the Gemological Institute of America (GIA) developed the Diamond Grading System and the 4 C's as a way to objectively compare and evaluate diamonds. Kenneth Gordon is proud to have studied at the main campus of GIA to obtain his Graduate Gemologist Diploma, earned in residence. Feel free to call or email him should you have questions concerning a diamond. The 4 C's of diamond quality will give you a multitude of information about a diamond's characteristics and value, but they can't begin to describe one elusive quality - beauty. To do that, you'll need to experience the diamond with your own eyes. 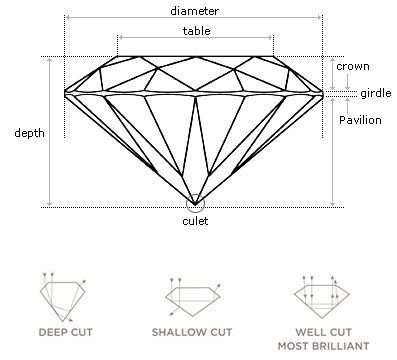 Cut is the most important of the 4 C's and has the greatest effect on a diamond's beauty. Cut fuels the diamond's fire, sparkle, and brilliance. 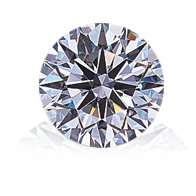 In grading, cut evaluates the cutters skill in the precise proportions, symmetry, and polish of its facets. In general, the better a diamond is cut the more brilliance it will have. The cut of a diamond has three attributes: brightness (the total light reflected from a diamond), fire (the dispersion of light into the colors of the spectrum), and scintillation (the light flashes - or sparkle - when a diamond moves). A wide range of proportion combinations are possible, and these ultimately affect the stone's ability to handle light. A diamond cut to good proportions will have more beauty and value than one which is not. Diamonds are valued by how closely they approach total colorlessness - the less color, the greater their rarity in nature and the higher their value. The diamond color grading scale varies from totally colorless to light yellow. The differences between one diamond color grade and another are very subtle and difficult to distinguish to the untrained eye. The grading scale begins with the letter D, representing colorless, and continues with increasing presence of color to the letter Z.
G-J: Near colorless: good to very good color, and this diamond may "face up" colorless when mounted, especially in white gold or platinum. K-M: Light but noticeable yellow or brownish tint. Not recommended for larger diamond stone purchases, especially in engagement rings. Out of the 4 C's, color and cut are the two most important characteristics of a diamond. Do not compromise on color. An "H" color or better is usually best. Thanks to nature, every diamond is unique. These identifying characteristics distinguish it from all other diamonds and serves as a fingerprint for your diamond. Clarity is the evaluation of a diamond's internal and external characteristics. The fewer inclusions or blemishes, the more desirable the diamond. Inclusions are internal, that is, inside the diamond. Crystals are merely minerals trapped inside the diamond; feathers are breaks in the diamond. Blemishes are usually very small and are only on the surface of diamonds. Then, evaluating the size, location, nature, number, and color of the inclusions and blemishes, a clarity grade is assigned. Slight inclusions in gem quality diamonds rarely effect durability or even appearance. Inclusions are visible under 10x magnification, SI clarity diamonds are usually of the best value since inclusions are not visible to the naked eye and prices are reasonable when compared to prices of the VS2 clarity and up grades. Carat. This word for the measurement of a diamond's weight is derived from the carob seeds that were used to balance scales in ancient times. A carat is a unit of weight equal to 200 milligrams, and there are 142 carats to an ounce. Carats are further divided into points. There are 100 points in a carat. A half-carat diamond is 50 points, written as 0.50, and so on. But two diamonds of equal weight can have very different values depending on the other factors determining quality. Since larger diamonds are more rare than smaller diamonds, diamond value tends to rise exponentially with carat weight. Thus, a one-carat diamond may cost more than twice as much as a one-half carat stone of equal quality. Also, as previously stated, weight does not always enhance the value of a diamond. In fact, when a stone is improperly cut, added weight may serve only to reduce its brilliance. The good news is diamonds of high quality can be found in all size ranges and represent the best value. The all important fifth C is confidence. The confidence you will have in doing business with someone you trust and feel comfortable with. Thank you for your confidence and allowing me to work with you, it's appreciated.